Discussion in 'UFOs, Aliens, Monsters, and the Paranormal' started by Mick West, Jan 10, 2015. Sometime in the 1950s the Cooper family of Texas bought an old house and moved into it. On their first night there, the father took a photo of Mom and Grandma posing with the two kids at the dining room table. Everyone was happy and smiling. They were living the American dream. But when the photo was subsequently developed, they saw, to their horror, that what looked like a body falling or hanging from the ceiling had materialized behind them. It hadn't been there when the father took the photo. So where had it come from? Was it an apparition of a deceased former tenant of the house? No one knew. 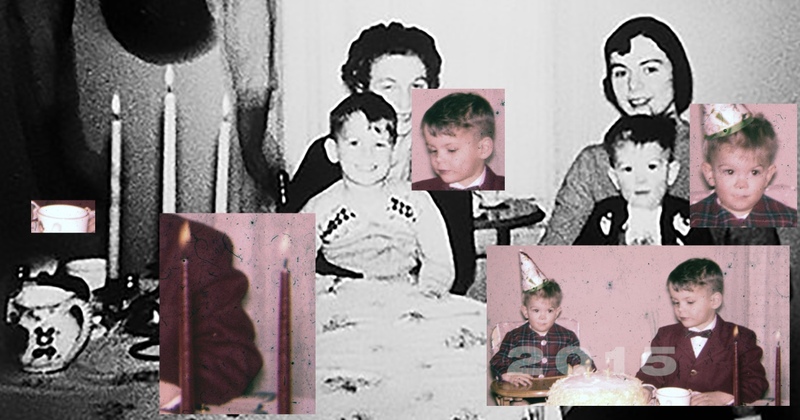 It appears to be a digital composite of an old family photo and another image, possibly a ballerina (suggested by @deirdre, here). The original posting of the image is unclear. The earliest known version is in 2009, by Thomas Ligotti. A likely origin is the thread that spawned the "Slender Man" meme: "Create Paranormal Images" on somethingawful.com, dating back to 2009 (tracked down by @Ray Von Geezer, here). The images created were deliberately subtle as the intent was trolling (posting hoax photos to get a reaction). In the above there is an ectoplasmic ghost face above the children on the left. Often the images were also supplied with a fake backstory. When my older brother sent me this link I was floored. We are the two boys in the picture. Well we were back in 1959. I have many picture like this one, but not this one. My mother had a habit of throwing away pictures that she didn't like. Eventually the ones she kept were passed along to me. What annoys me is that somebody got hold of a family photograph. The story is almost entirely fiction. Our last name is Copper, not Cooper. Does anybody know who did this? Robert kindly had an old slide scanned which shows that it is indeed him and and brother in the photo. Some sites, like Tumblr shares, go on to say how the boys had nightmares for years and years. Now i can't "debunk" as i havent yet found the original "hanging man" photo. The above link suggests professionals have examined it and it is genuine. But i disagree. The shadows are all wrong for one. 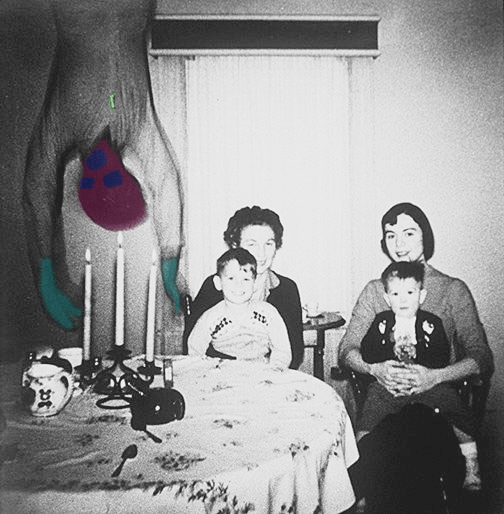 The hanging 'man' part has no light source for "his" shadows, as you can clearly see from the dark corner of the room and table side. And the candles' shadows are in the opposite direction. So if it is indeed a ghost "he" brought his own ghost lighting with him. Except, it isnt a man. It is a female ballet dancer or at least a female doing a ballet pose. When you turn the 'ghost' upright it becomes more obvious. the closest match i found to the dress and necklace on the "ghost" (disclaimer: could not find a frontal view of the dress) were pics from the 1970's of a dance instructor named Maria Vegh, who is still with us and teaching ballet. Her website is titled "An American Ballet Story"!! Of course, the "An American Horror Story" series came out 2 years after the 2009 date on the photo... but still. weird right? Interesting. The "ghost" and the candles are casting a shadow, but the people don't seem to be.... Who is the ghost again? I agree with everything stated above, and I am sure this is a fake and nothing paranormal is going on in the image, but I do not think we will convince anybody by arguing about light and shadows. This is the same issue as when one tries to debunk religion using science. "Ghosts" are not physical entities, and therefor one could always argue that light and shadow does not behave as expected. For believers, the only way to really debunk this would be to find the two original images that this most likely is composed from. But if they haven't been found by now, a simple google search probably would not reveal anything. kinda agree but a ghost throwing that strong of a shadow is a pretty big deal! plus the shadow of the 'ghosts' right hand doesnt match the hand curvature at all. not sure why they would have even bothered with adding a shadow, unless they wanted it to be obvious. Of course it seems from photos that not just dead people form ghosts, but also their already dead clothing. Ghost clothing must be a bit like schrodinger's cat. Simultaneously parading about preserving the modesty of ghosts and also cluttering up musty hand-me-down drawers of their descendants . Also, if this really was a hanging person, then why is the necklace hanging upwards around their neck?! Ghost jewellery is obviously lighter than air! and if this was a genuine ghost, I would be scared to death and never even dare to close my eyes again. So, it better be fake. It looks like a double exposure trick that I first time tried myself at school in early 1970s. It was done, usually, by printing two different negatives on the same positive (photographic paper), or, accidentally, by taking two different photos on the same negative (piece of film). 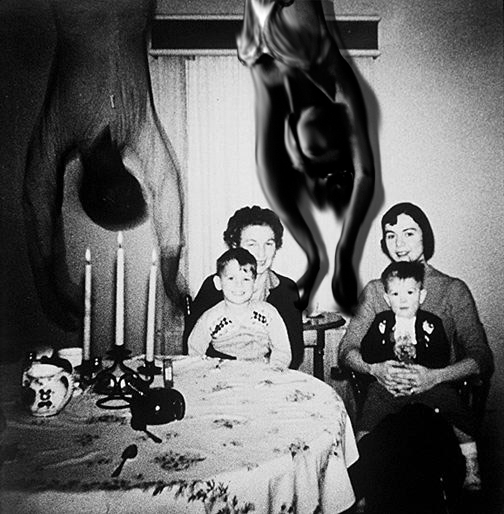 If not for the superimposed family image, the "ghost" figure would be illuminated more uniformly, or even be brighter on its apparently darker left side. What I thought was the shadow of the left arm, the most likely is a blur, doubling the arm's image. Neither of the arm's images appears to be the shadow of the other. Perhaps, the arm's movement was spotted by the photographer and the negative subsequently was discarded, but later inadvertently reused for the family photo. Hello guys, can I ask a question that is kind of relevant to this, in the hope that you may shed light on my own ghost image story. Can a digital image taken on a phone somehow glitch so that the thumbnail picture depicts a scene but when clicked on the larger image includes something else? I ask because a few years ago my partner went for a riverside walk and took a few photos of dutch barges and scenery etc. One of the pictures was of the river bank, looking up the river with a weir in the short distance and trees. When we clicked on the image there was a close up image of the side of a girls face taking up nearly half the photo. Close, as if my partner had walked right up to her and taken a picture but she hadn't noticed because she was looking down? We thought it was weird because she looked like a friend of ours but we checked all the other pics in the whole phone and she wasn't on any of them. We printed the photo and she was there. seems theres an app for that. Well, at least for double exposures on your phones (which looks very cool i must say). no idea what the thumbnail would look like or if the phone deletes the original individual pics. hard to believe the originals would be automatically deleted though. and with dubble you can 'double exposure' with friends apparently. The composition of the photo seems a bit odd, having the family off to one side looks like space was left for the "body", but I suppose that's easy to say - the photographer might have wanted to get the candelabra in, or he might just have been an early proponent of not centralising the subjects. Those aren't really shadows around the candles. 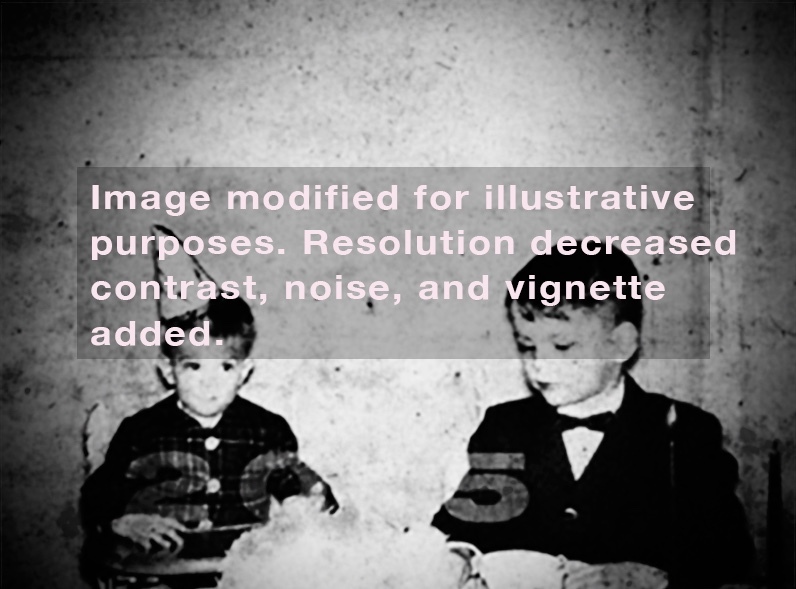 It's a common "glare" effect you get with old photography. Remember how sequins flashed black in old black and white TV? I think polarization was developed to fix it. The family picture looks too overexposed to be only a photographic artefact. The whites are suspiciously way too bright and the dark parts are a bit too dark. Also the grain of the picture looks like what you would have in photoshop after maxing up brightness and such on a bad resolution picture. I suspect a photoshop job, from looking at deirdre's ballet dancers photos, I tried to do the same effect. First I took an innocent picture of vintage dancer Margot Fonteyn in "Swan Lake"
Then I cropped the silhouette in photoshop, played with the levels to gain a stark contrast between the whites and the blacks of the picture. I then duplicated the picture and reduced the opacity of the double in order to have a shadowy transparent figure hanging behind the first one. Using the smudge tool, I blurred lots of stuff in order for it to be urecognisable. My photoshop job is a bit crude but I think it's not too far-fetched to suspect a montage like that. thats funny. 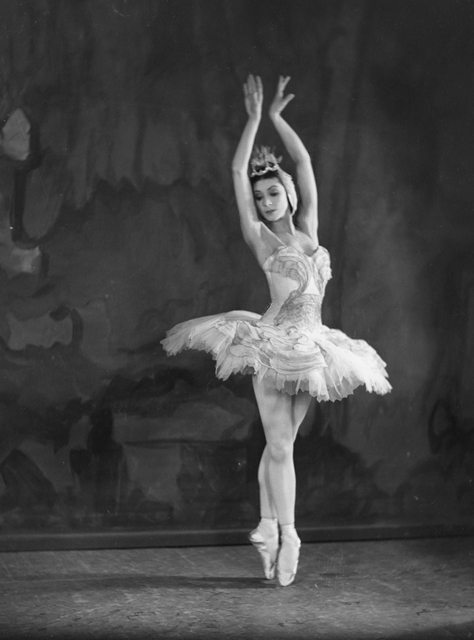 i thought Margot Fonteyn and swan lake too based on hand position. but i cant imagine her in that outfit! ugh. It looks far-fetched to me. OK, it could have been done in photoshop that does have tools for "old photo effects", but this suggestion results from an inspection of a digital copy presumably scanned from the original photo. Or, probably, a copy of a copy of a copy… Having no information about the original, we can only speculate and suggest many plausible explanations. Could you please clarify whether the background image in your photo corresponded exactly to what was in the photo's thumb or not? It looks like the person, whose face in the foreground, walked into the frame just after your partner had pressed the button. Taking the snapshot is not instantaneous, there can be a delay caused by autofocus. After the button has been pressed, camera waits a fraction of second for the sharpest full-size image, but meanwhile it could have recorded a thumb. This is my educated guess, as I do not know for sure whether your old motorola phone recorded thumbs separately or scaled down the full-size pictures. well was she in the vicinity when your friend was taking the pics? or was he all alone out there? add: there isa weird break line right above my red line.. her hair doesnt line up. and i might see trees superimposed on her hair... which could also be from you right now taking the pic of a pic. I was thinking maybe one picture got stuck on the other thru moisture whether intentional or not and left an imprint and then another copy was made??????? Water does a number on photos, there'd be at least some damage before it would transfer an image from one to the other. Damage seems very unlikely. Everything about the picture is consistent with a double exposure, which with a lot of older cameras is easy to do on accident (I have a couple from the 80's and 90's that have a mechanism to prevent it on accident, but can be manipulated carefully to allow it on purpose). The composition makes me think it was intentional. I have this picture of a WW2 vet thats been in a little plastic sleeve, like from a wallet. Anyway his face transferred from the picture to the plastic. Yes, I've had the same happen with a picture of my wife, and the picture shows distinctive damage as a result. It's actually worse with a picture against another picture, as both pictures will be damaged with parts of each transferring to the other. This picture is not at all damaged. Actually, I believe this photo is more legit that you all claim, and I find the would-be professional photography opinions very humerus and unfounded. Allow me to provide more detailed analysis from someone who does this professionally. This was employed to better see the anomalies and color overlays in the photo. Without these stats provided - I automatically debunk my own evidence (a *ahem* directed to the above user and many would-be evidence gathering youtubers). For starters, I went straight for the obvious - Anomalies and Producer Edits. In this image, I identify the LOSS OF QUALITY of the LENS with RED (at %20 Opacity), and the FLASH TRIGGER with GREEN (at %20 Opacity). GREEN also identifies the edge of what's called a VIGNETTE on the outer edge of the photo - now adays purposefully implemented for professional edits (assuming you own a $1K+ lens, as professionals do, most of these lenses are so good rarely catch clear vignettes unless you digitally edit them in or purposefully enhance them) - the lens in the image clearly has a dated vignette limitation as most do dating prior to 1990's without serious investments. Please know that I do understand that this is in-fact a JPG rendition of an original photo likely scanned with a rudimentary piece of hardware... not to mention potentially further encoded by plugins available, such those that come with WordPress or similarly to how encoding works on Facebook to reduce image filesizes. This was taken into account while working regions of the photo. This image was cropped to include the hangman figure in the sense of "Thirds" - if you don't know what "Thirds" are, you missed an important day in "Photography 101". The right side of the image is missing by est. %15-%25. This may have been on purpose to enhance the illusion, or an aesthetic choice after the ghost was discovered - and is further supported by the flashes reflections in the glass on the table. I can't speak for the taste of the photographer, and the quality of his gear (such as the ability to turret modern $400+ flashes), but it's likely directly towards the intended subjects. The original image may have even been cut/scissored physically before scanning. Knowing little about the family, I can tell you even less about the photographer - rich couples pay more than poor couples for professional shots (could have even been a family member or friend), and the gear of the professional reflects in his clientele. FIGURE 2 - CODENAME: Candles, And Chairs, And Lighting "Oh My"
Based on anomalies found in the photo from the hangman in BLUE (at %20 Opacity) - he is NOT far enough behind the candles to cast a shadow - or so close to the candles that any shadow/light cast would be hidden behind the character or only vaguely seen in the left (technically right) arm. Flash lighting on the clothing is highlighted in YELLOW (at %20 Opacity). The fact that this was missed actually guided me to do these edits to begin with, and the conclusion he was far enough behind the candles and casting an "incorrect shadow". He is either directly "on top" or in front of these candles based on the anomalies found around the character - partially interacting the the candles and the chair. This does open reasoning for debunk via image overlay. The hangman body parts, as displayed in PURPLE (at %20 Opacity), is either invisible or black - still leaving traces of the background image - or potentially grain gained. I've highlighted objects in the background that can be identified through the figure in CYAN (at %20 Opacity). Now, albeit, this could be anomalies created in photography through movement during a photograph with a slower shutter speed. If you don't understand how traces of a subject can be left behind while in movement (or in the dark gaining light) with a photograph taken at a lower shutter speed - you missed more than one day of "Photography 101". The right arm (technically left) of the hangman has the least amount of motion blur (assuming motion blur from lower shutter speeds can explain this) - yet it yields the most evidence of objects appearing behind/through the hangman. This is helped greatly thanks to the Cutain behind the subjects in the photo. Additionally, plaster can been seen through the hangman's head - but this could be explained away with grain (*shrug*). FIGURE 4 - Gravity Works. Period. Now it's to my reading you guys believe that what's on the hangman's shirt is a necklace -- and a necklace it could very well may be. But using various colors (at %20 opacity) - I've managed to identify very very very slight outlines of what could be the most identifiable features of "The Hangman", including head, eyes & mouth region, arms, and what could be a button, pendant, bone, or feather of some kind. Bone and feathers quite common amongst, lets say, African Americans. Gravity is indeed pulling that object downwards based on how it's anchored and dangling from the subject hangman. I don't believe for a moment that is a necklace defying gravity, but a clothing attachment popular in the mid to late 1800's - and I'd be willing to bet one could find a similar image of a man hanging by his feat with an identifying marker as such on his chest that was of little to no value to the guards -- such an image is popular in hollywood movies. I don't understand why hours of efforts would be invested into the image just to be fooled by gravity, I don't buy that and I haven't seen evidence to fully support the necklace theory - show me skills. The best part? I've attached the PSD used to create these images - as any good evidence finder should. I personally don't think the technology existed at the time the photo was taken to pull off such great edits (such as the opacity from the low shutter speed, which can be done today with photoshop), and if done during the time the photo was taken - DAYS, not HOURS, was invested into the creation. It could be an elaborate hoax of a modern user (ref. earliest 2009 when photoshop did exist), who may have in-fact edited in a figure in motion swinging upsidedown (causing an elongated head of motion), made a few editing mistakes and hid them well with a great deal of white balancing, vignetting, and extreme encoding which is very apparent in this photo. It is impossible to debunk, nor prove, due to the quality of this image - no matter how many filters you use that employ mathematical absolutes to better suite your personal desired results, including tools that de-artifact. I reserve the right to delete my images at any time (as they are hosted on my server) to avoid wasted bandwidth. I highly suggest all users collect the original files if they are interested in referring to this in the future. I will ignore and even go to lengths to delete my account to be left alone, but I will honor good evidence and arguments on this thread with a reply. Get it while it's valid. Enjoy. We are the two boys in the picture. Well we were back in 1959. I have many picture like this one, but not this one. Hi Robert, could you maybe post one of the other photos, to verify that this is actually you and your brother? Hi Mick, if I sent you another photo how would I no that this wont happen again? I really don't want this to happen again. well noone in the world would know it was you in the first place if you didnt just tell us all you can send a photo to Mick privately, but it would be nice to debunk the 'hanging ghost' thats what's making your pic go viral. Those are from the hoax photo, but if you could show something matching in another photo, then that would verify the story. There is very little information about this photo other that the Copper family moved into their new house and decided to take a family photo. After developing, the picture shows a body falling from the ceiling. That's exciting. It would be fantastic if the user is who they claim to be. 'Does anybody know who did this?' - I believe Google Chrome has a photo-tracking tool, it might help. Although I think everyone here is asking the same question. 'My mother had a habit of throwing away pictures that she didn't like.' - This statement throws me off a bit. More of a dodge, now proof is required. Nothing can be disproven about the photo, as opposed to the "story". This seems like a wild scheme to give a conspiracy life (or take it away), whilst the purpose of this site is quite the opposite. Like users reviving GLP stories from 2009-2010 for ad revenue and sub-site launches, could be very silly. That's exactly why Mick asked Robert for evidence. That only proves that metabunk is not ready to jump in any wagon only because it fits the beliefs of the majority of the forum. If there is no evidence for the claim, then the claim is invalid.
? of course it can. if the original of the family or the original of the lady dancing can be found. Or if the people in the photo can be found and they say that there was never any paranormal activity in the house, as the story says. *At this period in time. Sorry. Nothing about the current situation reveals either of those will surface, or that it's a lady. The *theory it might be a lady is an assumed connection, deirdre. what? if the pictures surface the hoax is debunked. they havent yet, which is why the title says Unexplained and not Debunked,psyringe. Nothing can be disproven about the photo, as opposed to the "story". This is why I don't particularly bother getting involved outside procuring physical evidence, and why I tailed my initial post as I did. I've already examined the photo, as have others. My claim stands, and will likely continue to stand. Pictures implies multiple photos, when in this reality there is only 1 - the one we have. So if this photo emerges in physical allowing for examination beyond digital compression, not multiple as your "if" implies, then better theories can emerge. The dancing lady theory is nice, but my examination of the photograph doesn't lead me to believe it's true. You're welcome to believe what you like. Right now we're posting in circles. i scrolled back and see you are the one with the long post about the noise being the wall seen through the ghost. so now i understand what you are saying better. sorry for the misunderstanding. Either way its not a man, that is an assumption of the story writer. While a trapeze artist or perhaps a male figure skater might wear those cuffs, the low waist "sash" is decidedly female.